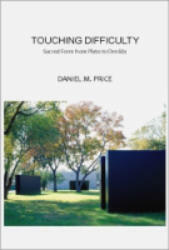 Title: Touching Difficulty: Sacred Form from Plato to Derrida Author: Daniel M. Price Imprint: The Davies Group, Publishers soft cover 362 pp. USD 27.00 ISBN 978-1934542095 May 2009 Touching Difficulty: Sacred Form from Plato to Derrida grounds the fundamental decisions about postmodernism, in both the understanding of singularity and of the sacred, in historical terms borrowed from both Greek and German traditions. The being of beings — the "oneness" variously characterized as the Sun’s light or the Goodness of form through Plato, Aristotle and Plotinus—is recast in Touching Difficulty as a movement of aesthetic singularity, or as a way of sustaining our contact with the sacred. Beginning with new accounts of their historical readings of both the Greeks and the German idealists, the stage is set for a decisive encounter between the familiar opposition between Heideggerian and Derridean approaches to technology, art and the metaphysics of presence. The current range of thinking about the "event" of being, arrayed between technological and anti-technological modes of producing meaning, is abandoned in favor of aesthetic gestures that sustain our fragile singularity. In such gestures — exemplified by early minimalism’s abandoned landscapes and machined geometric figures — one sees the way in which, even after abandoning the sense of form as the determination of matter, a world can still be conveyed as sustained within the trace of the sacred. Contents The Sun The silence of art: Bataille’s babbling sacrifice A map, of sorts Part One: Life’s Grave Traces The clarity of method and its demands Truths of displacement Aristotle and the trace of phenomenology Encompassing flow or receding deformation ... a first tracing The formal force of presence The creative force of form The force of an impotent demand Limitation and light: creatures of the possible The intellect moves as the necessity of exchange The trace as the force of the absent The trace and the gravity of words The trace as the absence—and the motion—of the intelligible Affirmation and absence Part Two: The Sense of a Gesture Deformation of one hand rather than another The difficulty of gestures The subject as the site of the representation of possibility The unity of the place of a doubled reflection The displacing and transcending logic of the power of representation On the place of the subject The beginning of the subjective Movement and method Belonging to the necessity of the element The divine task of beginning The necessity of the hand Part Three: The Difficult Gesture of Abandon The presence of an object—the force of a gesture The black box The vanishing compulsion The philosophical stakes of aesthetic form The dark gestures of the hand The presence of the frame ... and its gestures The originality of trust The silence evoked Notes Index Review What would it mean to doubt that the sun was here before we were? Would it simply be to carry out another Copernican turn of the Kantian type? Or does such a turn fall short of the question by representing our fundamental task as one of orientation? Did Nietzsche’s madman come closer when he asked if we were moving "away from all suns"? Or is this too—despite all appearances—another form of Neoplatonism? Is there another way to "doubt that the sun doth move"? To think the movement of—nothing? Touching Difficulty does more than touch on these difficult questions, inviting us to think of the sacred as nothing like the sun. To say that the book is "brilliant," therefore, doesn’t do it justice. It is nothing less than a complete rethinking of the history of metaphysics from Plato to Derrida and beyond. — Andrew Cutrofello, Professor of Philosophy Loyola University Chicago Author Dan Price has a Ph.D in philosophy and teaches at the Honors College of the University of Houston. He has written extensively on the nature of creativity and the expressive gestures through which meaning is sustained in aesthetics. His Without a Woman to Read: Toward the Daughter in Postmodernism (1997) addresses questions of metaphor and narrative, while the current volume searches for more fundamental characterizations of presence and absence in works of art.